world politics – OK, Fine. A White House leak shows that former British Prime Minister Tony Blair had given George W. Bush an unqualified pledge to join the Iraq War a year before the invasion started. The document – a memo – was written by then-Secretary of State Colin Powell to then-President George W. Bush. 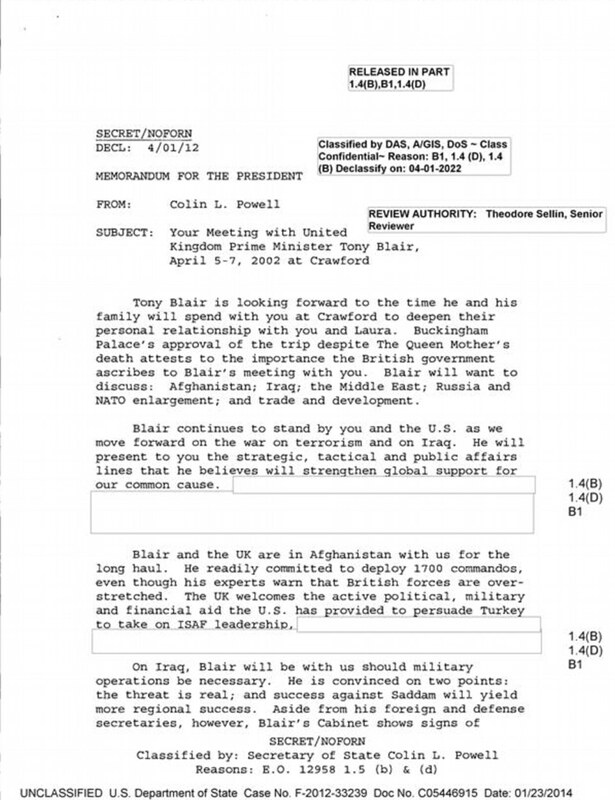 The memo goes against Blair’s public claims that he was seeking a diplomatic solution to the crisis at that time. Blair said to Parliament: “We’re not proposing military action” – in contrast to what the secret email now reveals. The classified document also discloses that Blair agreed to act as a type of spin doctor for the President by presenting “public affairs lines” to convince a skeptical public that Saddam had Weapons of Mass Destruction when none existed. 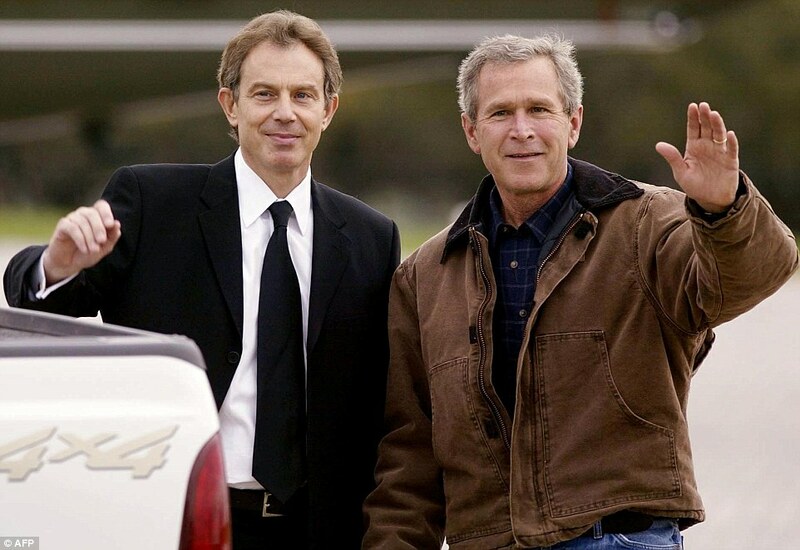 However, Bush would flatter Blair’s ego and give the impression that Britain was not America’s dog but an equal partner in a special relationship. The memo was written on March 28, 2002, a week before Bush’s famous summit with Blair at his Crawford ranch in Texas. The disclosure is certain to lead for calls for the Brits to reopen his inquiry into the Iraq War. A second explosive memo from the same cache also reveals how Bush used “spies” in the British Labour Party to help him to manipulate British public opinion in favor of the war. According to the Israeli newspaper Haaretz, Syrian troops backed by Hezbollah and Iranian fighters launched an offensive south of Aleppo province in Syria on Friday. The groups expanded a counter-attack against rebels across western Syria with support from Russian air strikes. This assault means the army is now pressing insurgents on several fronts near Syria’s main cities in the west, control of which would secure President Bashar Assad’s hold on power even if the east of the country is still held by Islamic State. The city of Aleppo is only 30 miles from the Turkish border. Aleppo, a commercial and industrial hub near the border with Turkey, was Syria’s largest city before its four-year civil war, which grew out of protests against Assad’s rule. Control of the city, still home to some two million people, is divided between the government and rebels. “This is the promised battle,” a senior military source in Syria said of the offensive. The group is backed by “hundreds of Hezbollah and Iranian forces which he said had made some gains on the ground,” according to Haaretz. Other sources such as Al-Arabia News state that “thousands” of Iranian troops are in the area. This was the first time Iranian fighters had taken part on such a scale in the Syrian conflict, said the military source, according to Haaretz. Hezbollah has supported Assad in several battles during the civil war, and said the army was carrying out a “broad military operation”, with support from Russian and Syrian jets, across a front at least 10 miles (15 km) wide from the southwest to southeast of Aleppo. It made no mention of Hezbollah fighters in its statement. Hezbollah is a Shia Islamist militant group and political party based in Lebanon, writes Wikipedia. Two senior regional sources said this week that Iran sent thousands of troops to Syria to bolster an offensive already underway in Hama province and ahead of the Aleppo attack, according to Haaretz. Iran says it has sent weapons and military advisers to support its ally Assad, but has denied providing troops. In the last week Iranian media have reported the deaths in Syria of three senior officers from Iran’s Revolutionary Guards Corps. Hossein Hamedani, a corps deputy commander, was killed near Aleppo and two other officers have also died fighting Islamic State forces in Syria, Iran’s Tasnim news agency said. Two senior Hezbollah officers have also been killed in Syria in the last week, a Lebanese security source said. Rami Abdulrahman, director of UK-based monitoring group the Syrian Observatory for Human Rights, said there were heavy clashes near the Jebel Azzan region, about 12 km (8 miles) south of Aleppo city. The area that the army and Russian jets were targeting was close to a main road heading south towards the capital Damascus, Abdulrahman said. The army had recaptured the village of Abtin from rebel fighters, he said, as well as a tank battalion base close to Sabiqiya village. Both villages lie close to Jebel Azzan. Rebels had hit one army tank with a U.S.-made TOW anti-tank missile. The U.S. is attempting to support “moderate” rebels. Unfortunately, sources claim that many “moderate” rebels collaborate with ISIS and al Nusra and have exchanged weapons. The military source said the rebel fighters were mainly from the Islamist group Ahrar al-Sham and al Qaeda’s Syrian wing, the Nusra Front, as well as the Suqour al-Sham and Failaq al-Sham insurgent groups. What Is The Situation With The Bombs In Turkey? On Saturday, there were two bomb explosions at a “peace rally” in Ankara, the Turkish capital. The number of killed varies in the news, but most outlets are reporting that “more than 100 people” died as a result of the blasts. Some news organizations call it the deadliest terror attack in Turkey’s history, others state it is the deadliest terror attack in recent history in Turkey. Who organized the peace rally? The BBC states that the pro-Kurdish HDP party organized Saturday’s rally. The Guardian writes that in addition to the HDP, pro-union and left-wing groups also took part. Who is responsible for the bombing? According to The Guardian, no group immediately claimed responsibility for the bombing, and the Turkish government has denied any part in it. To make things worse, as thousands later gathered near the scene to mourn, brief scuffles broke out as police used teargas to prevent people from laying flowers at the site of the attack. The pro-Kurdish People’s Democratic party (HDP) said some members of its delegation sustained injuries from the police. Witnesses and victims’ families felt that the government should have done more to protect the peace rally and that security should have been better. Mourners shouted anti-government slogans, and denounced Turkish President Recep Tayyip Erdoğan as a “murderer” and a “thief”. Many blame his Justice and Development (AK) party for security failures at Saturday’s peace march. According to the HDP, the number of people killed in the bombing stands at 128, all but eight of whom have been identified and their names published by the HDP’s crisis desk. Security analysts have pointed out the similarities to a suicide bomb attack in the Turkish border town of Suruç that killed 33 Kurdish and Turkish activists in July, which the Turkish government blamed on ISIS. According to The Guardian, the peace march was organized to call for an end to the escalating violence between the Turkish government and the outlawed Kurdistan Worker’s party (PKK). Saturday’s bomb attack in Ankara came three months after the breakdown of a mutual ceasefire between the Turkish government and the PKK. Hundreds of people have been killed in the escalating violence since then. According to The Guardian, hours after the Ankara bombing, the PKK announced an expected unilateral ceasefire, in order to avoid acts that could obstruct a “fair and just election” on November 1st in Turkey. On Saturday night, Turkish fighter jets launched airstrikes against PKK positions in Turkey and northern Iraq. The Kurds and the Kurdish PKK have been known for fighting against ISIS and other Islamic jihadists. A statement by the general chief of staff said 49 militants were killed and shelters and gun positions were destroyed. Security operations were also reported from the predominantly Kurdish province of Diyarbakir. The International Business Times and several British newspapers are reporting that Turkey (part of the NATO alliance) shot down a Russian fighter plane over its airspace. They report that social media users said there was a large explosion in Huraytan, northern Syria. 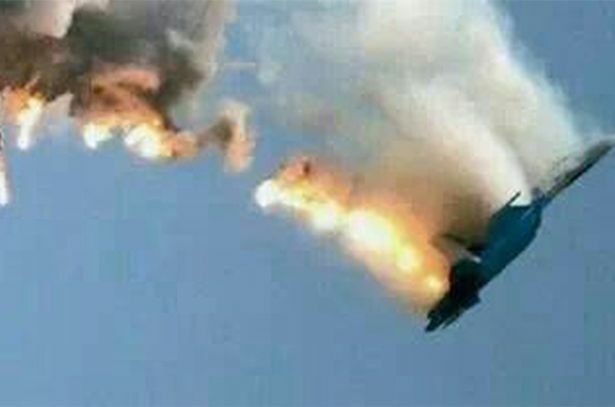 Last week Turkey said its jets had intercepted a Russian fighter in its airspace and the prime minister threatened to shoot down any plane that strayed in future. Two Turkish F-16s forced the plane back into Syrian airspace on Saturday and Ahmet Davutoglu called in the Russian ambassador to protest. Russia said the plane had entered Turkey “by mistake” and assured Ankara it would not happen again. Putin’s forces are currently supporting the Syrian regime by targeting President Bashir al-Assad’s opponents, including ISIS. The US does not believe the violation was an error and officials held emergency talks. Last Monday, Turkey’s military said a MIG-29 jet had harassed two Turkish F-16s for five minutes and 40 seconds on Sunday by locking its radar on to them. The incident comes amid concerns over Russian air strikes in Syria against foreign-backed rebels. The former chief of MI6 in England, Sir John Sawers, has warned there was a “real danger” of clashes between Russian and coalition warplanes if they mount rival operations in the skies over Syria.